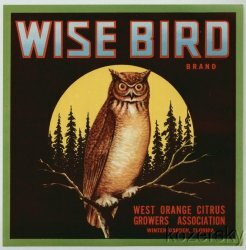 Wise Bird Brand Vintage Citrus Crate Label, West Orange Citrus Growers Assn., Winter Garden, Florida. Wise Bird Brand Vintage Citrus Crate Label. Original Wise Bird Citrus Crate Label, West Orange Citrus Growers Assn., Winter Garden, Florida. This original, mint 1940s label measures 9x9 inches. Image of owl with moon in background.